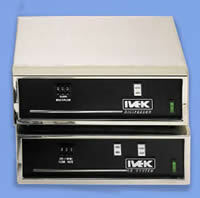 IVEK’s Ox and Digifeeder liquid metering systems are capable of programmable and highly repeatable flow rates ranging from microliters per minute to liters per minute. The Ox systems are time-based and flow rates are simply adjusted with a digital selector switch. After the initial setup, they require no mechanical adjustment or recalibration. Ox units can be enabled via manual and/or remote control. The Digifeeder systems are designed to interface with process control systems. They accept analog input signals to control flow rates. Changes in the analog input signal will proportionally change the flow rate. The input signal is converted to digital pulses that immediately and precisely control the stepping motor.